Are you an academic searching for an ecovillage as a case study for your survey? Are you a student intending to write an academic paper on an ecovillage? Are you a journalist interested in reporting on an ecovillage? Or are you an ecovillage community or member receiving requests from students or researchers asking to study your ecovillage? We, representatives of the Global Ecovillage Network (GEN) welcome your intention to research or report as a journalist on ecovillages. We kindly ask you to carefully read first the following information before contacting the ecovillages you wish to approach. This will make things easier for both you and our member communities. Ecovillages are increasingly approached by science, politics and media from almost all areas of science and research or in many different sub-disciplinary aspects. Ecovillages seem to be increasingly interesting as “all-round laboratories” of the future. Thorough research has already been conducted. An increasing number of publications are available to refer to. At this time, GEN can only provide basic information. However, we appreciate receiving more information from in order to update and improve this website. For approaching the ecovillage you are interested in, please visit an officially announced information day or weekend, if offered. This is the most authentic way to get to know an ecovillage. Take enough time to connect to the ecovillage, as this is the basis for profound research. Ecovillages are generally not able to afford accommodation and food for students and otherwise provide support your studies. You should look for resources on your own or ask your university. Be prepared to pay as a guest. Please read the requirements and guidelines on social empirical field work at your university and in the literature on scientific methods. These can give direction on how to deal with privacy, approaching interviewees and publishing data. You should let the organizers know about your research project in advance and they may be able to put you in contact with experts who you can connect with when you are there. If you want to raise the interest of an ecovillage, it is recommended, and will be highly appreciated, if you can offer a favor in return. For example, you can offer to contribute through volunteering like other guests in the kitchen, garden etc. or offer your skills in facilitation or minute-taking, etc. It is very important to us to keep a record of existing research and reports. Ecovillages are often quite interested in a view from the outside and appreciate your work. At the same time, this can also help your reputation. Please set up a profile and upload your research report or publications on researchgate or academics and use ecovillage as a keyword. 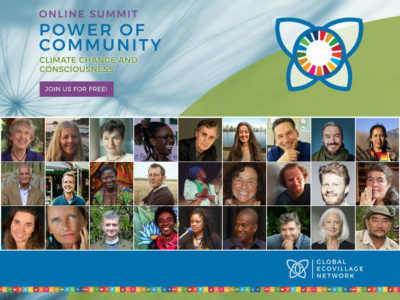 If you want to connect to other researchers around ecovillages, for networking on conferences, calls, and/or research funding, you are welcome to subscribe to our email listserve. Find more information see the bottom of this page.